The REMS Team's conclusions are unwarranted due to data that is easy to refute. Published 4/4/2017. Note: While my son's undergraduate research was vital to our findings, Dr. David A. Roffman did not participate in the writing of this article. All opinions expressed herein are those of Barry S. Roffman. Comments should be sent to Barrysroffman@gmail.com or MarsCorrect@gmail.com. This article will examine, in detail, remarks and conclusions published at http://cab.inta-csic.es/rems/en on Wednesday March 15th, 2017 by Jorge Pla-García, Antonio Molina, Javier Gómez-Elvira and the REMS team. Their original text is presented in dark blue fonts while our comments will be in black fonts. We will repeat their figures and add our own where appropriate. We are aware of several recent visits by the NASA, the REMS Team and by its associated organizations in Spain, namely on 3/29/30 the Instituto Nacional de Técnica Aeroespacial (INTA, English: National Institute of Aerospace Technology which is Spain's space agency), and on 3/30/2017 the Consejo Superior de Investigaciones. We often document changes to the daily weather reports made by the REMS Team and JPL after we have published print-screens of their daily weather reports for the MSL Curiosity lander. We believe that it's vital to have correct Martian meteorological data available so that SpaceX will have an accurate portrait of what to expect when they arrive at Mars. While we hope that America sends people to Mars first, we are also concerned about the very real possibility that flawed air pressure and weather data were at least in part to blame for the crash of the ExoMars 2016 Schiaparelli lander that we discuss in detail on this site in our article about Dr. Desai's Challenge on Martian Atmosphere Models. The REMS Team states: The tenth month of the thirty-third Mars year goes from sol 1534 to 1581 since the Curiosity landing. The rover drove uphill along 200 meters and climbed 15 meters in elevation on Aeolis Mons (the central mound inside Gale crater, also known informally as Mount Sharp) –an average slope of 7.5%– during these 47 sols. The area is located on the Bagnold dunes that overlie the Murray formation, composed of a fluvial-lacustrine mixture of materials, mostly fractured mudstones, with dark sand banks covering them in patches. According to the Sun position, this month goes from 270 to 300 solar longitude (Ls), being the first summer month –of three– in the southern hemisphere. As can be noted in Fig. 1, the annual maximum of atmospheric pressure was measured during the previous month (month 9), matching with the highest CO2 sublimation (ice turning into gas) in the martian south pole. The main component of the martian atmosphere is CO2, so the atmospheric pressure is mostly influenced by the total mass of this gas above the surface. The CO2 is seasonally stored in the poles as an ice cap overlying another ice cap made of water (and dust). The atmospheric pressure begins to drop during this month (month 10). As the autumn equinox approaches, the CO2 in the atmosphere starts to freeze over the southern polar cap, decreasing the air pressure. As expected, the atmospheric pressure is lower this month compared to the same month of previous years, since the rover is climbing Aeolis Mons –the higher the elevation, the lower the air pressure. * Note: While we refer to the first year of MSL operations as MSL Year 1, some NASA sources call it Year 0. By that standard in April, 2017 MSL is in its year 2 rather than 3. Table 2 above shows some (not all) of how JPL/REMS altered off the curve pressure data for August 2012 and on through at least April 2, 2017 after we either brought the deviations up to JPL Public Relations Director Guy Webster, or published them on our davidaroffman.com and marscorrect.com websites. ABSTRACT: We present evidence that NASA is seriously understating Martian air pressure. Our 7.5-year study critiques 1,651 Sols (well over two full Martian years) of highly problematic MSL Rover Environmental Monitoring Station (REM) weather data, and offers an in depth audit of over 8,311 hourly Viking 1 and 2 weather reports. We discuss analysis of technical papers, NASA documents, and personal interviews of transducer designers. We troubleshoot pressures based on radio occultation/spectroscopy, and the small pressure ranges that could be measured by Viking (18 mbar), Pathfinder and Phoenix (12 mbar), and MSL (11.5 mbar). For MSL there was a mean pressure of 11.49 mbar measured on its Sol 370. When we made an issue of it with JPL, it was revised to 8.65 mbar. The REMS Team then published pressures of 11.77 mbar (for Sol 1,160) and 12 mbar (for Sol 1,161). Again we made an issue of it, and they revised the figures to 8.98 and 8.97 mbar respectively. When they asserted a pressure 1154Pa for Sol 1301, we challenged it and they revised it to 752 Pa. In fact we demonstrate that JPL/REMS weather data was regularly revised after they studied critiques in working versions of this report and on our websites at http://marscorrect.com and http://davidaroffman.com. ROFFMAN RECORD OF MSL WEATHER REPORTS FOR YEAR 33 MONTH 10. We record daily REMS weather reports. We look for anomalies and make predictions of likely changes by the REMS Team. We back these predictions with print screen records of their reports before and after such corrections are made. Month 10 records here are extracted from our records of MSL Year 3 Summer, that is, the third summer experienced by MSL on Mars. This corresponds to Year 33 Month 10 (In an arbitrary convention, April 11th 1955 was adopted as the beginning of Mars year 1, because it was the year before the global dust storm of 1956, the first one to be investigated in detail.). (886) The Sol 1554 data is apparently odd in numerous ways. Watch for JPL to revise 10 Pa pressure rise and 30K change in max air temp to max ground temp. In the past errors like these also were noted for sols with VH UV values. See Figure 5. (886) THE PREDICTION ABOVE THAT JPL WOULD REVISE DATA FOR FOR 1554 WAS CORRECT. SEE FIGURE 5. 296 860 1/10/2017 0 -58 58 1.45 17 -62 79 17 -4 879 -19 297 N/A H H. Year 1 was VH (907) Unusually warm low air and ground temperatures. 19 Pa pressure difference from MSL Year 2 is off the curve. Watch for JPL to alter their report (shown below as Figure 6) for Sol 1575. 0 -73 73 1.825 17 -76 -93 17 -3 879 -8 297 N/A H H. Year 1 was VH (907) Bingo! Predicted changes in pressure and temperature above were carried out by NASA one day after the prediction. During this day this chart was first accessed by someone in Scottsdale, AZ believed to be associated with NASA. See Figure 6 again. ROFFMAN Figure 3 below: Monthly MSL Air and Ground High Temperatures as tracked by the Roffman Team. The REMS Team Continues: The highest daily air pressure is registered during the sunrise and the lowest during the sunset. Mars thermal tides are the weather phenomenon responsible for these significant, daily variations. The REMS Team states that a thermal tides occurs when sunlight heats the surface and atmosphere on the day side of the planet, causing air to expand upwards. At higher levels in the atmosphere, this bulge of air then expands outward, to the sides, in order to equalize the pressure around it. Air flows out of the bulge, lowering the pressure of air felt at the surface below the bulge. The result is a deeper atmosphere, but one that is less dense and has a lower pressure at the surface, than that away from the subsolar point. As Mars rotates beneath the sun, this bulge moves across the planet each day, from east to west. A fixed observer, such as REMS, measures a decrease in pressure during the day, followed by an increase in pressure at night. ROFFMAN COMMENT: We dispute both the pressures and the cause of the timing of these cycles assuming that they are true. As was made clear in our report Abstract, the weather seen simple does not match what is to be expected in a near vacuum. As for the timing, like Viking 1 and Viking 2, MSL used a radioisotope thermoelectric generator (RTG). We link pressure variation times to how gas pressure in a sealed container would vary with absolute temperature. Assuming that erroneous pressures offered by NASA are due to human error in pressure transducer design, when Viking 1, Viking 2 and MSL landed, dust kicked up by the retrorockets was sucked into the air intake tubes immediately and clogged the tiny dust filters. The pressure sensors on the inner side of these filters never got the chance needed to sense ambient air pressures. When the sun was about to rise, heat was needed to warm up the cold lander equipment. When the RTGs supplied the heat to the transducers it drove the pressure up at sunrise. Later in the day, before sunset, the heaters were not yet so necessary. So the pressure went down. After sunset RTGs again supplied heat to keep equipment from getting too cold. This drove pressure up again. See Sections 2 to 2.1 of our Report for further details. Temperatures were below zero during all the month, something common on Mars. The average temperature was around -40 °C, with an average daily maximum of almost -12 °C, while the minimum was around -70 °C (Fig. 2). It is important to note, however, that the temperatures oscillate every day about 60 °C, that is, more in a single sol than the annual average. ROFFMAN COMMENTS: Until July 3, 2013 we knew that over the first 11 months of operation the REMS Team and Ashima Research had put out clearly erroneous winds, sunrise and sunset times, pressure units, dates on their reports months and claims about relative humidity that were not reflected on their daily reports. We (wrongly) assumed however that at least the temperature reports were reliable. That assumption was demolished on July 3, 2013 when they revised all temperatures back to the landing, wiping out scores of days where they had claimed air temperature highs above freezing. Some of these revisions are visible on Table 4. Note that all above freezing temperatures were wiped out in the edit/revision. Ground temperature problems (which are greater) will be discussed later, however in looking over ground temperature highs for Mars Year 33 Month 10 it should be noted that the REMS Team indicated that they were all well above freezing, with the minimum high 11° C (51.8° F), 18° C (64.4° F) at Ls 293, and 20° C (68° F) seen on the cusp of the next month at Ls 300. Three of the air temperature high that month were also above freezing. The bottom line here is that we were told to believe one set of air temperatures from August 6, 2012 until July 2, 2013 - and then told to forget about them and to believe radically different temperatures. It may be that they thought nobody would notice - but we did and recorded them all - before and after the revisions. ROFFMAN Figure 3 below: Monthly MSL Air and Ground Low Temperatures as tracked by the Roffman Team. Roffman Figure 5 (blue background) - Sol 1553 to 1554 temperature and pressure anomalies and JPL fix after we highlighted the problem with Sol 1554 pressure and max temperatures. Roffman Figure 6 (black background) - Predicted JPL temperature alteration for sol 1575 occurs. What was the length of daylight hours at MSL when a record ground temperature low of -110° C was recorded at Ls 340? The REMS report indicated a sunrise at 06:46 and a sunset at 18:52. That’s 12 hours 6 minutes. REMS did not post correct times until after we had proven their partner (Ashima Research) posted times that are totally bogus (in fact, impossible). We posted all the correct times at http://davidaroffman.com/photo4_26.html. REMS then matched them, and Ashima Research went on to take down their site. The David Roffman calculation for Ls 340 is given below. It shows a day length of 12 hours 6.98 minutes, less than a minute off of the REMS post (which rounds off sunrise and sunset times to the nearest minute). Table 4 shows the spreadsheet calculation we used for Ls 340. HOW FAR HAS CURIOSITY TRAVELLED? Figure 7 below shows that as of early December 2016 it had travelled 9.3 miles (15 miles). As of Sol 1648 on it had gone a total of 9.89 miles (15.92 km). Figure 7 below: MSL Curiosity elevations. ARE NASA AND REMS SCIENTISTS TRYING TO DO SOME WHISTLEBLOWING? Even after REMS-related Spanish scientists’ visits to our sites, REMS continues to publish insane ground temperature data. Are they deliberately trying to sabotage REMS credibility in an effort to alter the destructive effects on non-American-Government Mars landers? As we show on Figure 4, from the landing in August 2012 up until the REMS report in March 2017, no ground temperature low was colder than -101° C. But for Sol 1650 on March 2017 REMS reported a low of 110° C - and this was not in an MSL winter, it was at Ls 340 in the tail end of summer at MSL. What was even odder was that this extremely cold temperature was not at all matched by an extremely cold air temperature. And odder still was that the ground temperature was 35° C colder than the air temperature 1.5 meters above it. That's a drop of 63° F, and it too is unprecedented. Figure 7 - Even after REMS-related Spanish scientists visit to our sites, REMS continues to publish insane ground temperature data. Are they deliberately trying to sabatoge REMS credibility, and with it the destructive effects on non- American Government Mars landers? The average ground temperature measured this month was very stable around -33 °C (Fig. 5 - renumbered and shown as Figure 2B above), which is a bit higher than during the same month of previous years. These small daily variations could be caused by a low and constant thermal inertia of the materials that the rover found along her track. The multiple dune fields close to the rover is consistent with this behavior, since the small particle size of the sand reduces its capability to store heat, and follow fast the thermal variations on the air. Those temperatures change dramatically during the day, with a 80 to 100 degree difference between day and night – much higher that the seasonal variations. An accuracy of 10K is almost worthless when looking at so many temperatures hovering around 273K (0° C). 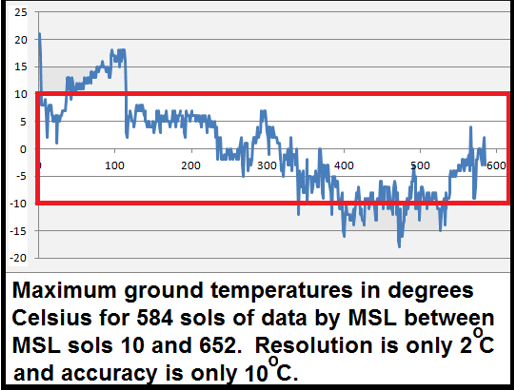 In fact, looking at the data from MSL Sols 10 through 652, the REMS Team offered maximum and minimum ground temperature for 584 sols. Fully 413 of the highs (over 70%) were between 283K (10° C) and 263 K (-10° C). See Figure 49 of our Basic Report. In spring of MSL Year 3 a maximum ground temperature of +24° C was recorded on Sol 1428 at Ls 202. If there was an accuracy in the range 1 K or better we could probably deduce something intelligent about air density by looking at the rate of heat loss from the surface up to the boom, but with an accuracy of only 10K on the ground and 5 K in the air, it really isn’t worth the effort to do the math. The decision to go with such inaccurate sensors may be due to incompetence, or to design. All that can be said is that for $2.5 billion, we got inaccurate temperature sensors, nonfunctioning wind sensors, a relative humidity sensor that did not merit inclusion of its data on any daily weather reports, and, of course, the same pressure sensor as that on Phoenix that caused its designer so much distress. We also got a lot of data that was often suspiciously revised or deleted by JPL.